I received an email reminder from Kingsford Charcoal that September 1 was International Bacon Day. In recognition of International Bacon day (yes, I too was surprised that there was such a day of celebration, but hey, why not? ), I made some Pig Candy for my family. I lament that it’s only one day a year as I would not complain if it was a month instead of just one day. Therefore, I made an executive decision and took the liberty of extending my bacon day into the entire month of September. Apparently, this Bacon Day was conceived 2000 in Bedford, Massachusetts and is observed the Saturday before Labor Day in the United States. 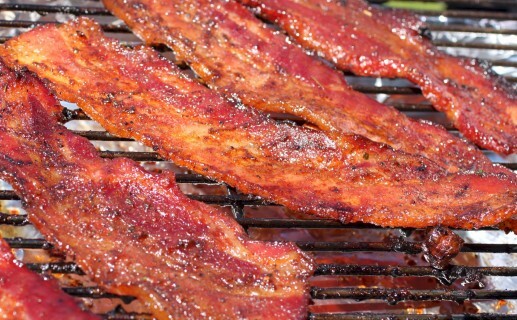 It’s a day when everyone has free reign to do whatever they want with bacon. I’ll feature more bacon recipes this month but for this post, I’ll share a very easy recipe that is guaranteed to make you new friends as they cannot just eat one. Just don’t try to bring this to a vegetarian party! Yes, it’s not the healthiest snack food but one bite goes a long way. Well, maybe three or four candy sticks are better! It’s super easy to make with only 4 ingredients and it’s best to start with the best bacon you can find. The bacon I used was courtesy of cookpigs.com, a very nice couple Mike and Krys Cook from Fallbrook in North San Diego whom I visited to see their pig farm and to obtain a mini whole hog which is the subject of a future blog. They raise a specialty breed of pig called the Red Wattle (the meat is a deep red) which is a breed derived from eastern Texas. What is unique about Red Wattle is its marbling and its amazingly flavorful and delicious meat. It is nothing like I’ve tasted and in my quest for the best competition pork, I’ve eaten a lot of pork breeds including Kurobata, Duroc, Berkshire, Yorkshire, Chester White, and Hampshire. They raise their animals using a micro-biotic diet of local produce including avocados and beer mash, and the pigs are finished on macadamia nuts before they become pork. They also receive first class care including living in soil corrals and generally live a comfortable life on a roll-in-the-mud slow-grow program. The end result is a product that is sought after by restaurants chefs and aficionados’ like me. Red Wattle is to pork what Kobe is to beef. I’ll be posting more recipes of the Red Wattle cuts I’ve been cooking and enjoying later on my website. Meanwhile enjoy this very easy but delicious pig candy recipe. You can use store bought bacon and it’ll still be gobbled up by your guests. 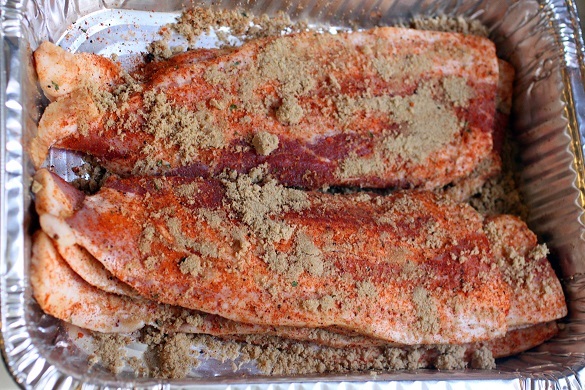 Sprinkle SYD Hot rub liberally on the bacon. Apply brown sugar, more or less is up to you. 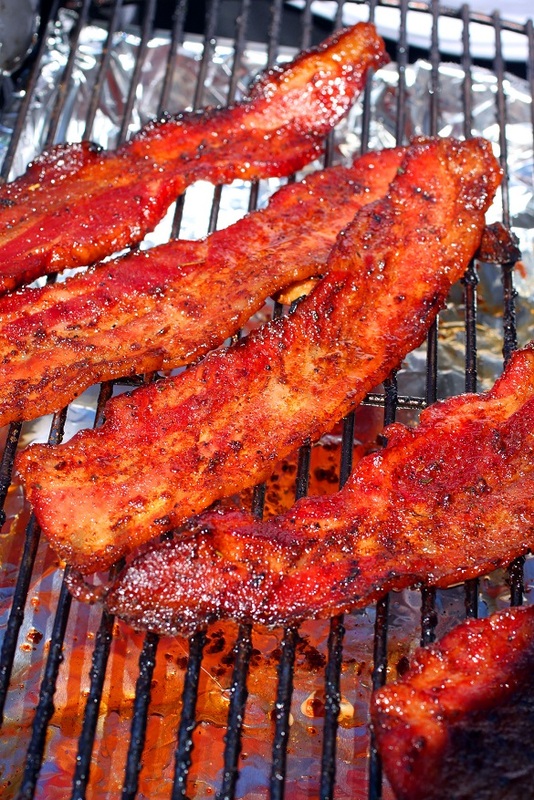 I like a lot of brown sugar and it caramelizes very nicely to give the bacon a candy like taste and texture. Sprinkle some cayenne pepper if you like your pig candy spicy. Cook on the top grate in a 300 degree pit with some apple wood to provide flavoring smoke.